Office building is a place where large numbers of people stay. If emergencies occur, building management department must ensure ordered and timely evacuation. To do so, the building management should develop an emergency evacuation plan which will be posted in key locations throughout each floor. Otherwise, the emergency may result in serious injury or casualty. Additionally, each employee in that building should get familiar with the escape routes. 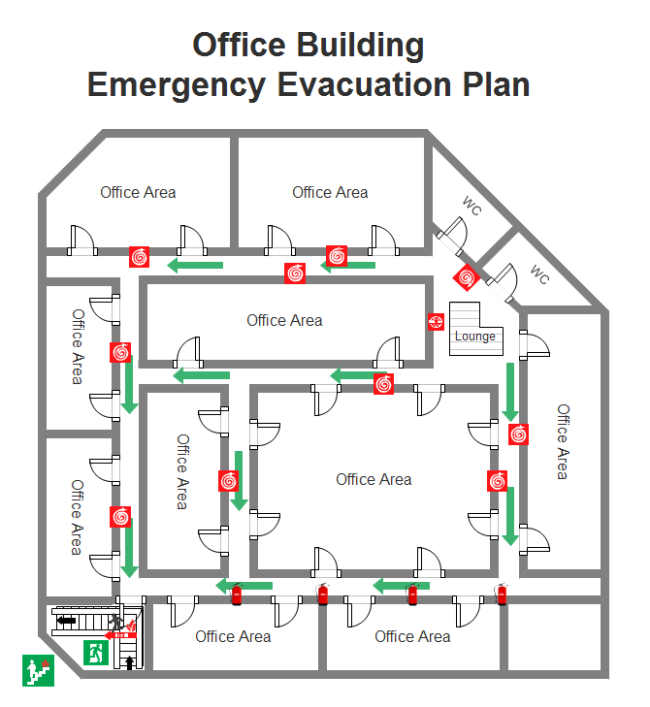 Copies of evacuation/emergency plans should be posted at each work station, at the lobby desk and handed out to all involved people. By being prepared, people won't get panic and will respond as quickly as possible. That is why an office emergency evacuation plan is so important. Actually, it won't take much time to create an emergency evacuation plan with a suitable and powerful tool. You can use predefined symbols representing walls, fire extinguisher, exit and emergency phones and so on. NO pen, NO drawing skill or experience is needed. You just need one tool - Edraw and a few minutes. Download Edraw right now for free to try it for 30 days. It offers all essential ingredients needed to create emergency evacuation plans. Step 1. Observe each room of the building carefully. Find the locations of emergency phone and fire hose and extinguisher. Step 2. Discuss and plan the escape routes. Aim to identify at least two routes for each room, typically the normal route into and out of the room along with an alternative such as a window. Check regularly and keep the escape routes free from any obstacle like table, rubbish and so on. Step 3. Visualize the escape routes through Edraw. Follow the steps below to do it. Start Edraw and choose Floor Plans in Available Templates pane. Double click Fire and Emergency Plan to open the necessary stencil and a blank canvas. Drag and drop shapes onto the blank canvas. Resize, connect and adjust shapes according to the building structure. Show the escape routes with arrow shapes. Insert text to add labels showing locations. A more detailed and informative guide is available in article: make fire and emergency plans. Step 4. Print and hang/stick the plan on the visible place or hand it out to all related people. More than 50 symbols are specially designed to ease the process of drawing emergency plan by Edraw. 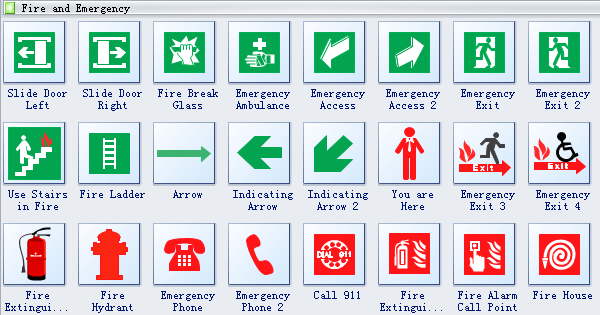 Its emergency plan symbols are all vector format with control and selection handles. It is quite easy to edit these shapes. With connection points, connecting them is also effortless. See the illustration below. Learn more about these symbols in Fire and Emergency Plan Symbols. As you can see, the escape route, extinguisher and fire hose are all visualized by visible shapes in this diagram. This example is characterized by editable shapes, attached text box and various formats. Find more fire escape examples here.